Few people know that more than 4,000 Italian prisoners were tragically drowned in the Saronic Gulf, close to Athens, where, according to the most accurate version of events, the requisitioned by the Germans steamer collided, due to a shipping error and bad weather conditions, on Gaidouronisi islet known also as Patroclus Island, near Sounion, on the southern tip of Attica. Patroklos island in the background. Poseidon Temple on the hill in the foreground. The “Oria” capsized and then sank, though not before almost two days and nights had passed, taking with her to a watery grave and oblivion until a few years ago, over 4,000 unfortunate Italian soldiers who were kept prisoners in the cargo hold of the ship. “Since 1996 I had information from some fishermen who caught in their nets mess tins and other war material from an unknown wreck southeast of Patroclus. 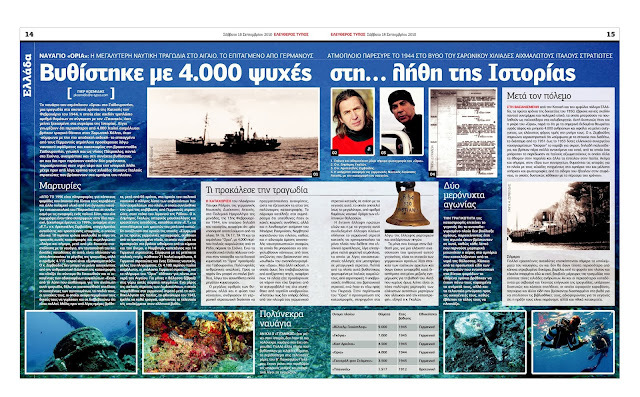 I combined this information with reports of an old diver who had described a place full of debris and human remains in the same area and we started investigations in 1999″ Mr.Zervoudis, a professional diver and amateur historian said. “According to the nazi German archives, just the Norwegian captain and 14 German soldiers managed to escape. According to Italian sources 21 prisoners, six German soldiers and a Greek sailor were the only ones to get away from the shipwreck alive. Approximately 4,100 Italian prisoners, the remaining German soldiers and the crew of the “Oria” drowned. The findings concluded that bad weather and the miscalculation of the Norwegian captain of the ship Bjorn Rasmussen were the main causes of the shipwreck. The Germans failed to send any rescue vessels in the area, which could have saved at least some of the survivors who were in the cargo holds of the “Oria”. All that we have at our disposal, are the nazi German archivesand few data from Italian archives” Mr. Galon says. In the 1950s Greece was full of wreckage and war material, which could be sold as scrap to steel factories. This unfortunately was the fate of the “Oria”, although by today’s standards it is considered a tomb and monument for over 4,000 people and must be left untouched, as a minimum tribute to their memory.